We're excited about a new project in Chapel Hill. 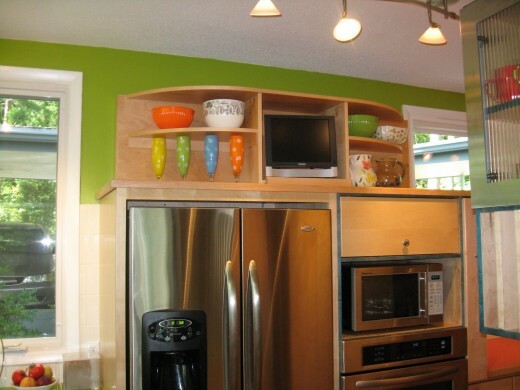 A few years ago, we installed a new kitchen for this homeowner, who had purchased a beautiful property close to the University of North Carolina, and surrounded by a large protected natural area. The home was built in the 1950's, and has a large, and essentially flat roof. With no attic there is little room for insulation. The first issue, however, was that the walls needed insulation. We teamed up with Carolina Foam Inc out of Dunn, NC who bored quarter size holes through the wood siding in each stud bay, and blew in expansive foam insulation. With the success of the wall insulation, the homeowner started asking about the option of using a foam product on their roof. Having been thinking about how to get a roofing quote in Orland Park IL and replace their leaking roof, and improve their insulation, the foam option made a lot of sense. Having done similar applications on numerous commercial buildings, Carolina Foam suggested two one inch layers of a closed cell spray on foam product called Endura Tech. On top of the foam, they applied two 15 mil coats of an acrylic poly-urethane rubber roof coating. One of the surprising aspects of this option was it's affordability. It was comparably priced to installing a more traditional TPO membrane - but had the distinct advantage of adding a considerable R-value! Once the system was agreed on, we got started. Roofing contractor in blaine minnesota tores off the existing built up asphalt roofing, and repaired several roof deck board. As soon as the weather allowed, Carolina Foam got started. In no time, the sprayed on foam roof was complete. 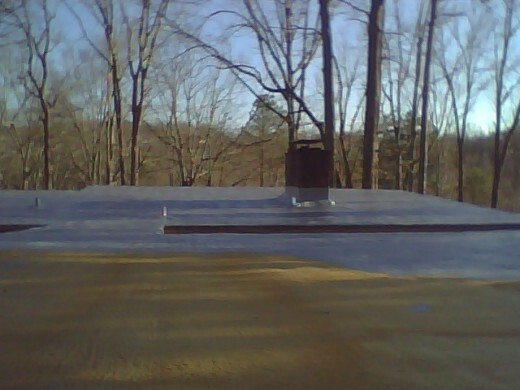 This picture shows the roof with the second coat of foam on and 1/2 of the acrylic polyurethane (gray) applied. With the roof work complete, we were able to start focusing on the rest of the project. One of the plans was to install a spiral staircase from a newly built deck, to the roof of the existing carport. Why would you need a staircase to get up on your roof? Well, you need easy access if you're planning on installing a "green" or "living" roof. A living roof is generally any roof of a building that features a waterproof membrane and soil. That soil is then used to cultivate vegetation. The vegetation can vary from ornamental shrubs and trees to vegetable gardens to a simple grassy area. The living roof not only adds green space to an area that might be lacking but it also provides an added layer of insulation. That extra layer of insulation can help cut back on both heating and cooling costs. If you plan to add almost 3,000 square feet of dirt, plants, and water to make a green space up on your South facing roof you need to plan a few things out! First of all, we were lucky, and the homeowner had an original set of blue prints - showing the spans and dimensions of the framing used in the roof construction. That combined with a consult from a local structural engineer gave us the confidence that the roof could handle the added load. Another consideration was how to keep all that roof vegetation sufficiently watered..... not to mention having to plan on a significant increase to your water bill, right? Not if you plan on installing a rainwater retention system! So a plan was devised to install an underground tank to harvest rain drained from the roof. That same water will then be pumped back up to the roof into drip irrigation lines to water the roof garden (learn more). First things first. Deciding on how to retain the runoff from the roof. A 3600 square foot roof can drain a whole lot of water! Trying to figure out the best way to retain that water underground wasn't easy. We looked at a variety of options......including pre-formed plastic cisterns, free form tanks built with plastic forms and a heavy duty rubber membrane, and precast concrete cisterns. 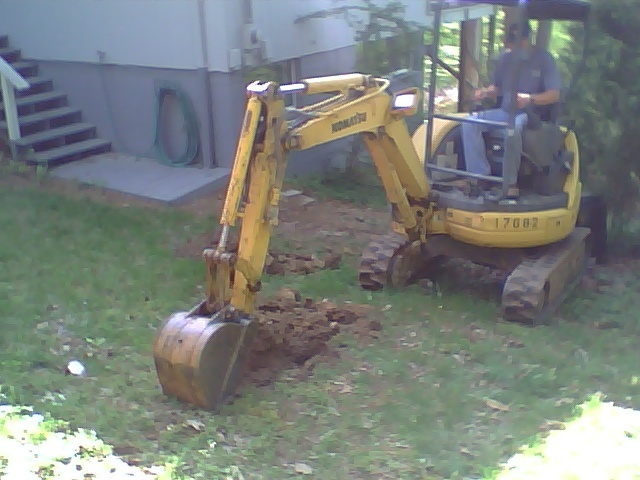 Ultimately it ended up that installing a standard concrete septic tank with dual ports and inlets was both the easiest, quickest and most cost effective option. Excavation has now begun! It takes a big hole to set a 3500 gallon water retention tank. This will be an exciting project to follow! Learn more from Atlanta Water Damage Pro.